acknowledged Representative Jarrett Keohokalole and welcomed everyone. "The Sustainable Hawaii Youth Leadership Initiative, SHYLI, provides opportunities for Hawaiiʻs youth to become the environmental stewardship leaders who will carry these islands, isolated and surrounded by thousands of miles of ocean, forward towards a sustainable future. We are excited that the Windward Community College Pacific Center for Environmental Studies (PaCES) can contribute to SHYLIʻs nurturing of these future leaders." The Sustainable Hawaii Youth Leadership Initiative mission is to inspire young people to envision, plan and create a more sustainable future for their lives and their islands. 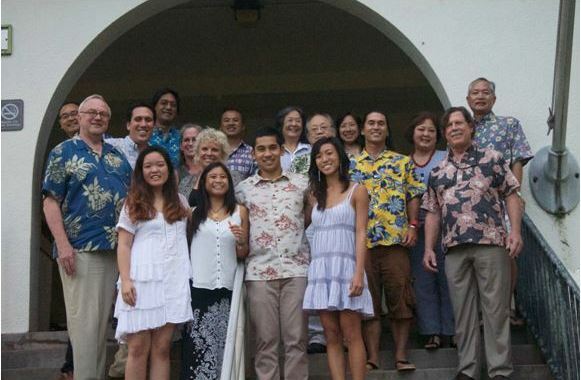 Founded in 2010 on Hawaii Island, SHYLI expanded to Lanai (2013) and Oahu (2014). SHYLI is a project of the Stone Soup Leadership Institute, a 501c3 non-profit education organization. from education, business, government and their community to catalyze significant actions on our islands. As a board member of Public Schools Hawaii Foundation I'm very hopeful that SHYLI coming to the Windward community will benefit many more young people." On Becoming a Global Sustainability Leader. "The gathering at Windward Community College was invigorating and informative," Karen Kimura, Castle High School's Community Outreach Coordinator. "Thank you for expanding Jackie's horizons in a life changing way. I know she is a stronger leader, more empowered young woman and very purpose filled as a result of her transformative Stone Soup experience. Mahalo!" Serena Le shared her action plans for SHYLI Sustainability-In-Action Project - and her goal of encouraging all the great environmental organizations to collaborate to exponentially benefit many more youth - and their community. In preparation for their trip to the Summit, SHYLI Windward youth delegates prepared a presentation on sustainable activities happening in Hawaii. They learned about best practices from islands around the world. SHYLI Emerging Leader Trevor Tanaka, a junior at Chapman College, shared his journey to develop Sustainability Resolution #25. Trevor is supporting Serena with her SHYLI project, so that educators have a cost-effective way to implement his Resolution. Trevor and Serena will present it at SHYLI's 2nd Design Sustainable Hawaii Forum in January 2016. In partnership with Design Thinking Hawaii, held at Windward Community College youth share their vision and their progress with their projects with Hawaii's decision makers from business, public policy, education and nonprofits. "The relationship with NALU Studies and SHYLI resulted in our youth having a better understanding of their role as not only community leaders but leaders on a global scale," said NALU's Former Director Manning Tate III. "In this time of expanded media and enhanced technology, it is really critical that we change our mindset. We need to look at our responsibilities on a global scale. What we do on a local level can have an impact on the planet. Even though we are 1 of 7 Billion people, that one person can have a major positive impact - like recycling and beach cleanups. The NALU Studies and SHYLI partnership offers a better understanding of our youth role, responsibilities, and obligations to the planet and to the global community. I'm very grateful for the opportunity that our students had to participate in this program. I look forward to continue partnership that will allow our kids to grow beyond just the Hawaii Island community and to expand out to global relationships." Upon her return from the Summit Celeste Ye quickly realized her dream of her first career job - right out of college! As NALU's teacher, she is preparing middle school students to become environmental stewards of their communities. Celeste's parents were proud of their daughter's accomplishments. It is exciting to see the environmental education/conservation movement unfurl with the next generation of SHYLI leaders effecting change to build sustainable island communities where resources are limited, said Jennie and Rylan Ye. Thank you for your role in making this happen! SHYLI Windward is now developing its year round program to provide leadership development and follow up support for youth delegates, their Sustainability-In-Action Project and their 5 year Action Plans. For SHYLI's Career Mentor and Job Shadow Day Program youth are matched with business, government and academic professionals in their fields of interest. SHYLI's holds monthly leadership trainings on the interdisciplinary field of STEM-Sustainability while helping them develop their entrepreneurial and problem solving skills, and develop Sustainability-In-Action Projects. "I am extremely proud of Jackie Noborikawa, our Castle High School delegate to SHYLI," said Lisa Sbragia, Social Studies Teacher, James B. Castle High School. Jackie returned from her adventure at the Youth Leadership Summit with a reinvigorated "can do attitude." She has a strong desire to improve both our school and influence our community through her SHYLI Sustainability-In-Action Project. She is eager to prove that one person CAN make a difference. If we keep supporting and cultivating these very genuine, global-minded youth leaders, ready to roll up their sleeves and get out there and get it done, the sustainability of our future world is extremely bright. Great Job."